Welcome back to our tour of the Git object model. In this video, we'll go beyond the base objects and look at more of the structure with tags, branches, and remotes, as well as reviewing how the various Git commands act on this collection of objects. Note - If you haven't watched the First Part of this review of the Git object model, we highly recommend you go back and do that now, as this video largely builds on that foundation. Blobs - Our base objects, storing the contents of a single version of a file. Trees - Trees store directory listings, pointing at blobs and other trees to define a full directory structure. Commits - Commits lock in a version of our code, pointing at a single tree, the "working tree", as well as holding the commit message and author info. Commits also point at parent commits to capture the history of our code. In the previous video, we focused primarily on the objects directory, which acted as a database of the blob, tree, and commit objects we created as we worked with our repo. The first directory we'll encounter within the refs directory is heads. These are our local branches. The directory is called heads, as our local branches are the collection of things that HEAD can point at.HEAD is the ultimate ref, defining what we currently have checked out. Now we have a full picture of what exactly our master branch is: a file, stored in .git/refs/heads. Its contents are the hash of a single commit. We know that commits contain a pointer to the working tree, as well as parent commits, and now we can add branches to the list of pointers in our view of the Git world. Branches are just pointers; nothing more! Just like our master file, the v0.1 file contains nothing more than the hash of a commit. It is possible for tags, unlike branches, to grow a bit more complex by adding things like annotations, PGP signatures, and other metadata. In this case, they will be stored in the .git/objects directory, and the tag file will simply contain the hash of that tag object (which will contain the hash of the commit that was tagged).This just adds one additional step, so we can still think of tags as simple pointers to commits. While branches and tags are very similar in that they both simply contain a reference to a commit, they differ in that branches can change what they point at, but tags cannot. Tags exist to lock down and name ("tag", if you will) a specific version of the code. Branches exist to track the changes in our codebase over time, and will therefore update whenever we commit or merge. With the more real-world example of the Upcase Git repo, we can see that there is now a third subdirectory alongside heads and tags in the .git/refs directory. Again, we see more of the same. Remote branches are simply pointers to a commit. It's pointers all the way down, friends! HEAD is the final object we need to be aware of to understand Git. HEAD, unlike the other objects we've discussed, is a singleton, meaning that there is only ever one HEAD. HEAD identifies the currently checked out object. Typically, this is a branch (with that branch pointing to a commit), but it is possible to check out a commit directly, in which case HEAD would be pointing at that commit. So once again we find ourselves with a pointer. 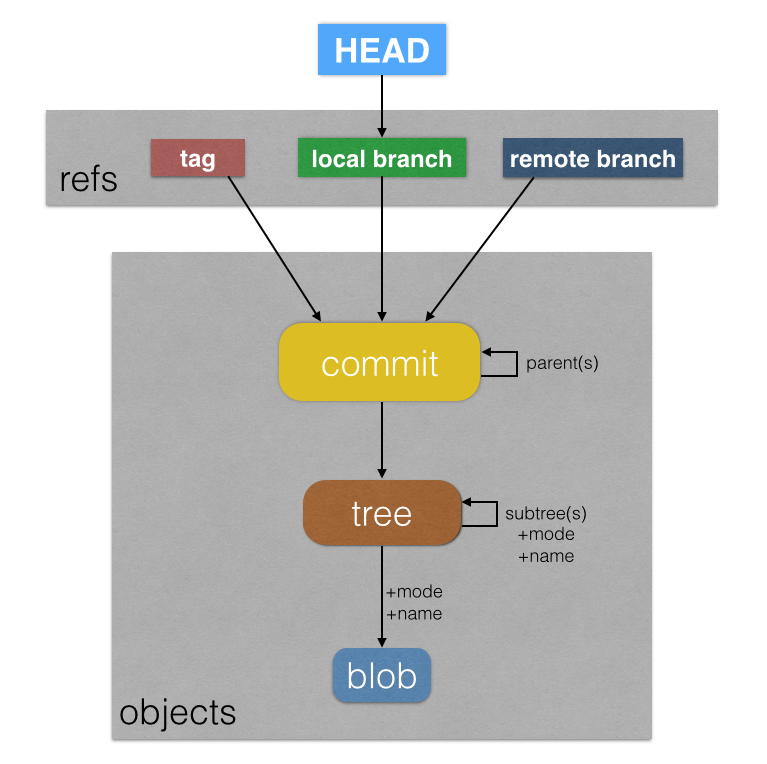 HEAD points to a branch, that branch points to a commit, and that commit points to a working tree and parent commit. Pointers. All. The. Way. Down. And, with the addition of HEAD, we have a complete picture of the Git object model. Objects - blobs, trees, and commits. Refs - branches, tags, and remote branches. HEAD - The single pointer to rule them all. Now that we understand the objects that are used throughout Git, we're going to zoom out a bit and focus primarily on commits and refs. Nearly all operations in Git involve commits, although typically these commits are referenced through refs like branches and remotes. Checking out a new branch is just the act of creating a ref file, specifically a "head", and populating it with the relevant commit hash. First Git will follow from the HEAD to the current branch to determine what commit hash that branch points at. With that info, Git creates a new file in .git/refs/headswith our new branch name as the file name, and the commit hash as the contents. Lastly, it updates HEAD to point at this new ref. is largely the same as the last check out, but instead of starting from HEAD, we start from the specified branch to determine the commit to point at, and use that to populate our new ref file. There's an alternative form of checkout when we check out a file by specifying a ref. Technically, we need a tree to get to a specific version of a file, but Git's pointer system also allows for something to be "tree-ish". When something is tree-ish, it will eventually lead to a single tree by dereferencing the pointers. A commit is tree-ish because commits point at a single tree for the working directory. Refs are tree-ish because they point at commits, which point at a tree. Even HEAD is tree-ish by the same logic. Committing takes all of the staged objects and stores them as needed. This typically involves at least one new blob, and a new tree for the current version of the working directory. It then builds a commit object that points at our new tree, as well as the commit we are currently on. Lastly, it updates our checked out branch to point at this newly created commit. $ git commit -m "Add new file"
A fast-forward merge is about the simplest operation we can perform. It creates no new objects, instead simply updating the current branch to reference a different commit. A traditional merge is much more interesting. We start with two diverging histories, and Git creates a new tree for us from the two existing trees. Once it has the new tree, Git will create a new commit that points at this tree. Lastly, the branch ref will be updated to point at this new commit. Comparing these two merge strategies, it becomes clear why we prefer the fast-forward only merges. In a fast-forward merge we are just updating a pointer, but the code is not changed. In a traditional merge, Git does its best to bring together two different versions of the code, creating a new commit and tree that we have not interacted with. So with this comparison of traditional and fast-forward merges in mind, we can talk about our good friend rebase. Rebase can be performed when we have new commits on both our feature branch, and our "upstream" branch (typically master). We want to update the commits on our branch so they include the changes on master. When we rebase, we essentially replay our work on the current version of the upstream branch. Git does this by calculating each of the diffs for the commits unique to our branch, then applies them onto the upstream branch one by one. Each application of a diff creates a new commit, reusing the associated commit message and author details. Note that the old commits still exist, but they are now orphaned. No refs point to them any longer and so they are essentially unreachable, although we know from the discussion of the reflog in the first video that we could easily restore them by checking the reflog. Once all the new commits have been created, our branch is updated to point at the tip commit of our rebased group. From here, we could now fast-forward merge the master branch into ours, as we are now in line with its history. The key difference between this and a traditional merge is that all of the commits here were created by us, and we get to interact with them and test them as needed before merging them into master. Interactive rebase is very similar. We begin with a set of commits, typically on a feature branch and ahead of master, and we perform our interactive rebase. When we squash them down, we create a new commit using the tree of our former tip commit, and compose a new commit message. Once again, we can see that the old commits live on despite being orphaned, and we can therefore get back to them as needed.